There are many ways to extend your growing season. We cover many of the basics in “Protecting Plants from Frost – 12 Ways to Beat the Cold Weather“, but in this post we're focusing on greenhouses. There are a ton of DIY greenhouse options online, but many won't hold up to extended use, or they skip some recommended components (like good ventilation). 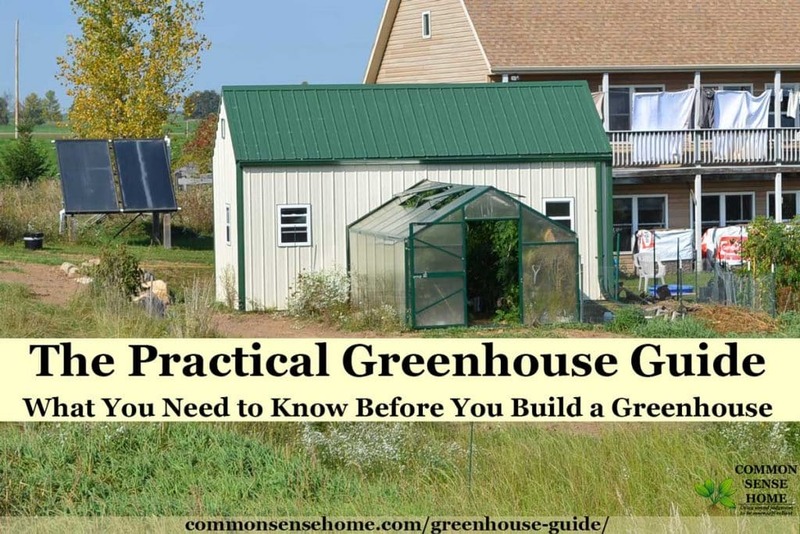 In this post we're going to give you the information you need to choose the right greenhouse option for you – from cheap mini greenhouses to large hoophouses and earth sheltered greenhouses. We'll talk about greenhouse costs, types of greenhouses, locating your greenhouse and planning for operation. A greenhouse is a building with clear walls where plants are grown to protect them from cold weather or other environmental issues (such as pests). Greenhouses were originally made with glass walls, but many modern greenhouses uses plastic sheeting, multiwall polycarbonate or other plastic options. 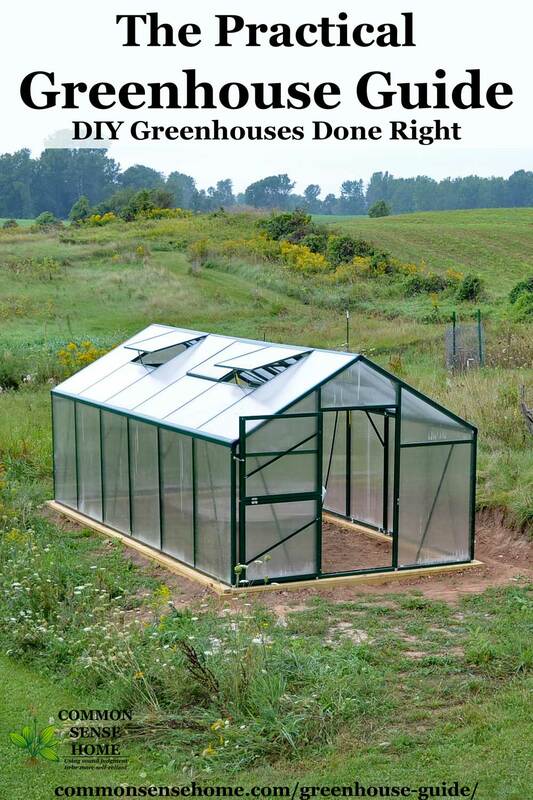 Greenhouses range in size from tiny counter top models (best suited to small plants or terrariums) to massive commercial greenhouse complexes covering acres of ground. You can add extra heat to your greenhouse, or count on the sun to get the job done. Climate battery greenhouses (like those discussed in “The Forest Garden Greenhouse“) store heat underground to grow tropical plants in temperate growing areas. Can you build your own greenhouse? Absolutely! 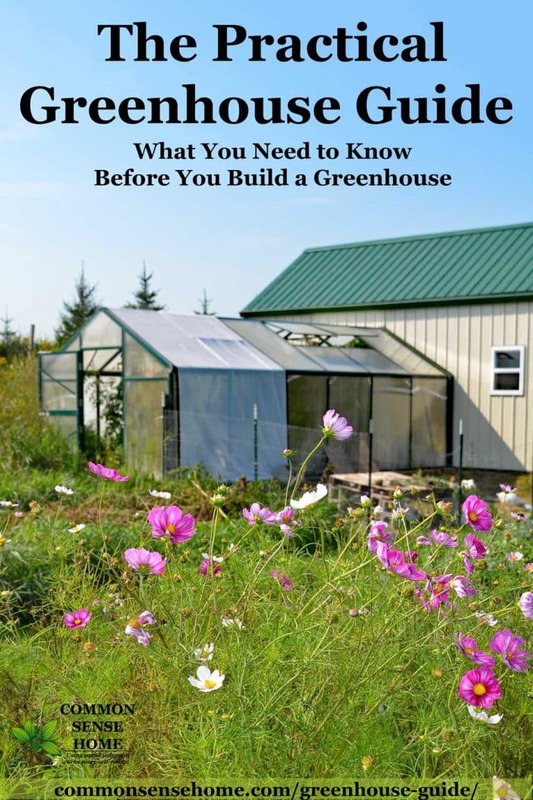 There are tons of options for the DIY greenhouse builder – from step by step guides, to basic kits, to large formal greenhouses. Or – you can improvise with materials on hand. The size of the greenhouse, the materials, heating/ventilation and watering will determine the overall cost. Purchase one or more good thermostats for any greenhouse, especially large greenhouses. A greenhouse can save you money by reducing your grocery bill, so it's not just an expense, it's an investment. Putting off another purchase (like a trip or phone upgrade) could help fund a large greenhouse kit. A greenhouse can help you through a job change or rough financial period and can give you a green retreat in your back yard. There are many greenhouse options and they can vary dramatically in cost, size and complexity. Figure out your budget, how you would like to use your greenhouse, and how much space you need. Some home greenhouse options are listed below. A “lean-to” greenhouse is similar to a cold frame, but is larger and sloped. In many cases its attached to the south side of a home. Clerestory greenhouse – using a south facing greenhouse possibly earth bermed – with the celerestory overhang giving increased exposure and growing area and a “back area” for planting tools, materials processing and a loft area or full 2nd story for either larger fruit trees or a complete 2nd story greenhouse. Whether you choose to build your own greenhouse, assemble a kit or have one built professionally, you still need to pick the right place to put it. Use the list below to help select your greenhouse location. Make sure there are no local ordinances, permits or restrictive covenants that would impact building a greenhouse. In general a cold frame and other temporary will not require permits, however, they may be covered in home owner association covenants. Find a flat area that isn't likely to see flooding or heavy runoff. If you plant to plant directly in the soil of your greenhouse, do a soil test. Make sure there aren't any contaminants in the soil. For instance, some older home have lead contamination from old paint near the home. Some trees, like black walnuts, inhibit plant growth near the tree. If you're planning to have a concrete slab put down and mount your greenhouse on the slab, then obviously soil is not concern. If you want to skip the slab, see “Build a Secure Greenhouse Foundation That Preserves Your Growing Space“. Remember that the snow can build up on and around the greenhouse. The greenhouse can create a melt and freeze cycle that can be damaging if your foundation is not done correctly. Snow is also heavy, so be sure you have a solution for the maximum snow loads for your area. Light duty hoop houses will collapse under heavy snow loads. Most greenhouses will be built in zone 7 or colder. Make sure the greenhouse has full sunlight. 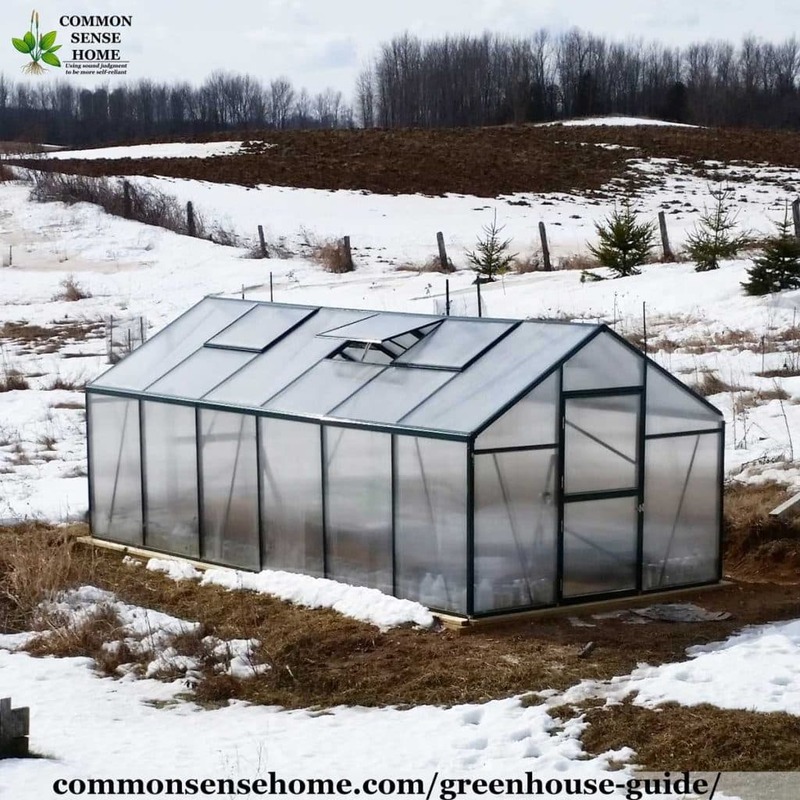 Consider the low solar angle in the middle of the coldest months so that the greenhouse is getting maximum sunlight and is not shaded to the east, south or west. Locate the greenhouse near water, or be sure to at least have large watering options that won’t freeze and break in the cold. It won't rain inside the greenhouse unless you have a retractable roof, so you will need to water by hand, have drip irrigation or a sprinkler system. If you want power to the greenhouse, plan accordingly. Learn your prevailing winds and wind speed “wind load”. A greenhouse needs to be anchored and aligned to the wind if you have regular high winds. Protect the greenhouse from prevailing winds for your area if possible. Wind protection could include a treeline or other windblock, possibly even an earth berm (see below). There are a number of things that are critical to the construction and use of nearly any greenhouse. Good airflow is important. The intent of a greenhouse is to capture heat, but it can get too hot. A greenhouse will need manual or automatic ventilation or your plants will die. Too little airflow and high temperature can also lead to mold and other diseases that you might not be accustomed to. There are temperature powered pistons that will open and close panels, manual cranks and electronically controlled vents and fans that you might need depending on the temperature and size of the greenhouse. Larger greenhouses will hold more heat and will need more ventilation – possibly including opening panels, roll-up panels and fans. A greenhouse is a protected area that is warm. Bugs and mice want to enjoy it as much as your plants. Keep your greenhouse clean and watch out for infestations. Aphids, fungus, gnats, cutworms and other caterpillars, whiteflies, shore flies, slugs and bloodworms are some common greenhouse pests. Mice, shrews and snakes may also move in. (The snakes eat the other pests, but may be surprising to run into.) Anything you spray on your plants won't get washed off by rains, so choose your treatments wisely. See The Ultimate Guide to Natural Pest Control in the Garden and The Best Ways to Get Rid of Mice for control tips. You will want to foster good bugs, or at least let them have access. Whether its honeybees, mason bees or bumblebees, you need your pollinators. You may also want to inoculate the soil or plants with mycorrhizal fungi, to help establish a healthy ecosystem. Welcome worms and other healthy soil dwellers with plenty of organic matter in your soil. Since a greenhouse is enclosed, water must be provided. Whether it is a powered sprinkler system, gravity fed drip system or hand watering, think ahead about water. Where will you get the water, and how will you store it. There are many options including rain barrels, tieing to well pumps, hand pumps and simply carrying buckets. Regularly test your soil and amend as needed. Having extra organic matter will help with moisture retention. The ideal pH range depends on what you are growing. For generic vegetable garden plants go for 6-7 pH. Adding untreated leaves, compost and other extra organic matter and working the soil can improve the quality of the soil. It's an exchange. Remember to add what the soil needs, so you can take good veggies. If you put soil in your hand and make a fist it should hold together but not form a solid mass. It should hold together and crumble fairly easily. Greenhouse shelves should be rust and rot resistant. Metal shelving should be powder coated and allow water to fall through the shelves. Shelves could be as simple as wood planks supported by cinder blocks. Rubber coated open wire frame shelving is a simple option. If you build out of wood, consider cedar to avoid rotting. We don't recommend using green treat in the greenhouse shelving as the chemicals can leach out of the wood, onto the plants and into your food. 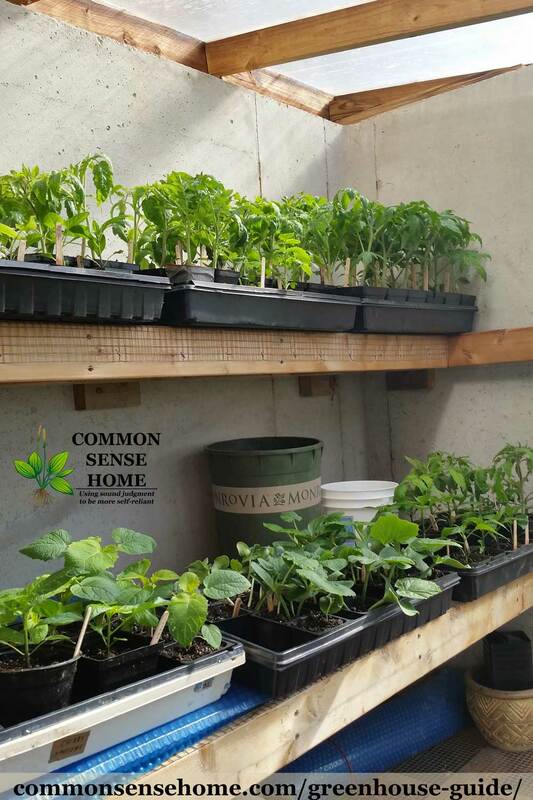 Build shelves that match the 11″ by 22″ standard plant trays, or your planting containers of choice. Two or three shelves allow you to have multiple shelves giving vertical space. To optimize access consider two shelves with the bottom being 22″ deep and the top being 11″ deep. In northern climates with heavy snow a you might want a solid side wall that is 2 to 4 feet high. It could be metal siding or wood panels or cinder block. This can also provide some protection from critters (raccoons, rabbits etc), especially if you put it a foot+ below the ground level. 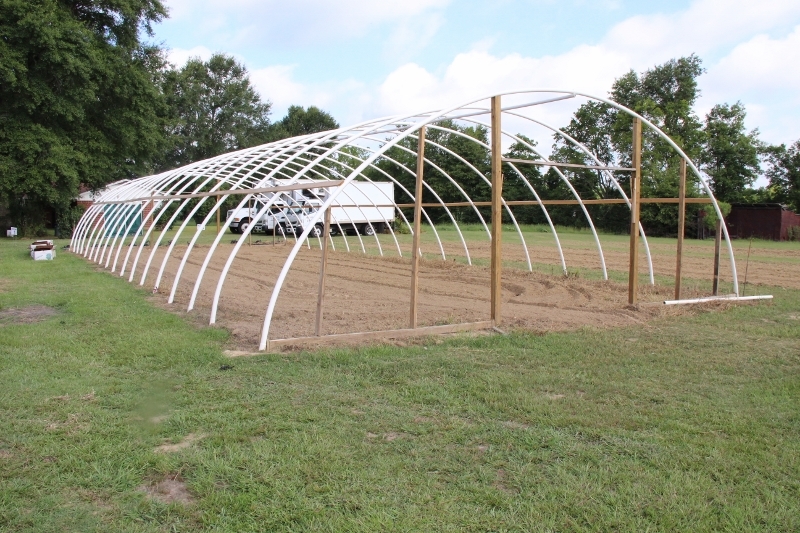 The solid sidewall can be added to stick built greenhouse (2×4) construction (glass or plastic) or a hoop house (PVC pipe) with plastic sheeting. The short sidewall can provide some wind protection and give a surface that the side wall plastic sheeting roll can connect to (for summer ventilation). In colder northern climates, your “winter greenhouse” will likely need a greenhouse heater. You also need extra thermal mass, which could be large black barrels of water, or soil or both. A greenhouse that can protect from below zero temperatures needs a heat source. 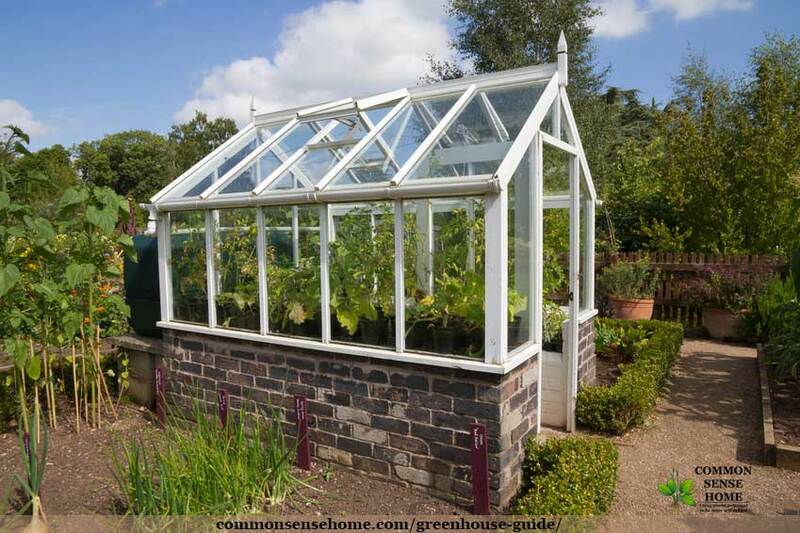 Heated greenhouses are also known as a warm house, hot house or a conservatory. Heat sources for greenhouses include: hydronic heat (in floor heating), geothermal, electric fan heaters, wood fired rocket heater or even a simple Ben Franklin stove inside the greenhouse. Fires are more complicated and create higher temperature swings. A rocket mass heater or masonry stove are better options that release heat more slowly. The simplest solution is the electric fan heaters, but they are also most expensive. You can provide an extra layer of frost protection with row covers (blankets, sheets or “horticultural fleece”) on particularly cold nights, creating a “greenhouse within a greenhouse”. If you have enough, bubble wrap works as a good insulator to reduce heat loss, and still allows some solar gain. In colder climates, a double wall greenhouse can reduce heat loss. Basically, it's a greenhouse inside a greenhouse. Using the air of the outer greenhouse as a thermal barrier for the inner greenhouse. This costs 2x as much and creates some summer venting challenges, but does reduce overall heat loss considerably. Add mass to reduce heat. This can be earth, water jugs or large water drums. The mass absorbs heat during the day and releases it at night. This solution will not work in more northern zones without an additional heat source because of the numerous days without direct sunlight. You can use ground temperature to increase or stabilize the temperature in your greenhouse. An earth sheltered greenhouse is also known as a “walipini”. The soil below the frost line maintains a fairly steady temperature year round. In a root cellar, the soil temp is used to keep produce cool. In a greenhouse, the addition of a clear cover to allow sunlight in traps and holds heat. The soil acts as insulation, and helps keep the greenhouse from falling below freezing. Don't expect a magical tropical oasis from digging a hole in the ground and covering it with plastic. “Build this underground greenhouse for only $300” is not a working reality for most people. Even with the ground temperature advantage of an earth sheltered greenhouse, you may still need to add heat if there is loss through the cover, or the temperatures remain well below zero. Near our home here in northeast Wisconsin, a friend built a fully earth sheltered greenhouse on the south side of her garage. Even with adding many 50 gallon drums filled with water for thermal mass and a makeshift climate battery and a multiwall polycarbonate cover, the temperatures in winter still drop so low that only very cold hardy plants survive. “Underground” or earth sheltered greenhouses can also suffer from flooding and collapse. Only build this type of greenhouse after doing a lot of research. Another option is to berm or shelter one or two walls of the greenhouse. 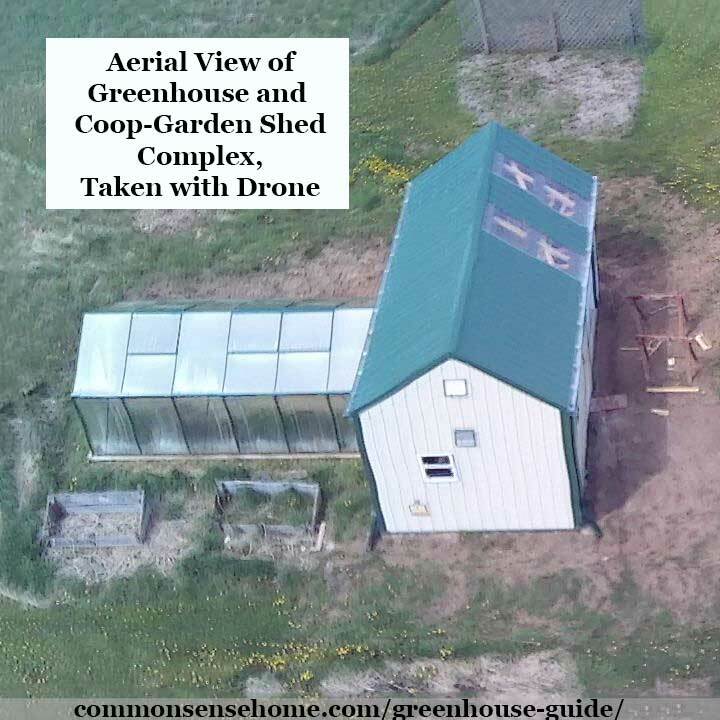 Traditionally, a greenhouse is fully bermed or earth sheltered the north side (south side in the southern hemisphere) and partially protected on the east and west sides. This normally requires a sloping south facing exposure and excavation. The earth berm provides insulation, wind protection and thermal mass, but also complicates the construction. It may not be appropriate for suburban or urban locations due to space constraints. Attached greenhouses can provide a lot of benefits. Since they are easy to access, you're more likely to visit regularly to maintain and enjoy your plants. 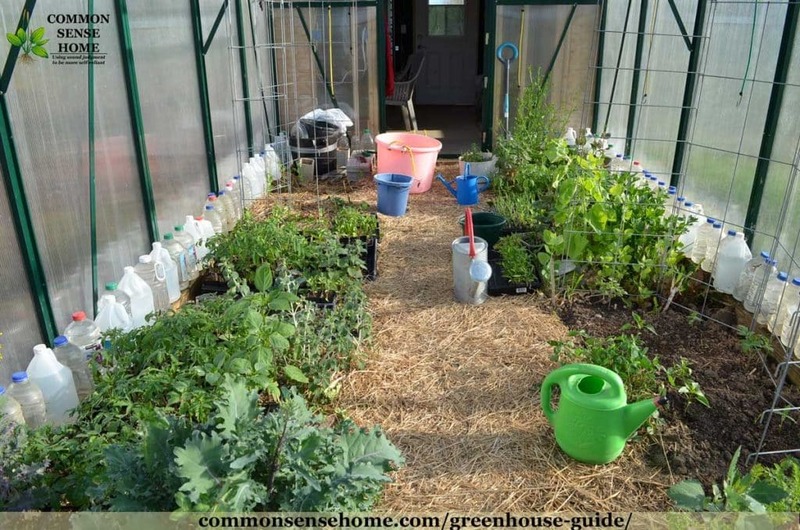 Another option is to attach a greenhouse to a shed or outbuilding. This can provide a heat source such as a fireplace or stove, without the direct heat. The outbuilding also gives you a place to store greenhouse tools and other gardening items. It can also act as an airlock, so the greenhouse isn't exposed to direct winter temperatures. Hydroponics is growing plants without soil. The plans are grown in water that has nutrients and minerals. In many cases hydroponics are combined with fish production resulting in aquaponics. If you want to combine your greenhouse with hydroponics (and/or aquaponics) you will need electricity, heat, and water. Be sure to do research before you choose hydroponics or aquaponics. Some greenhouses combine fish and a greenhouse. 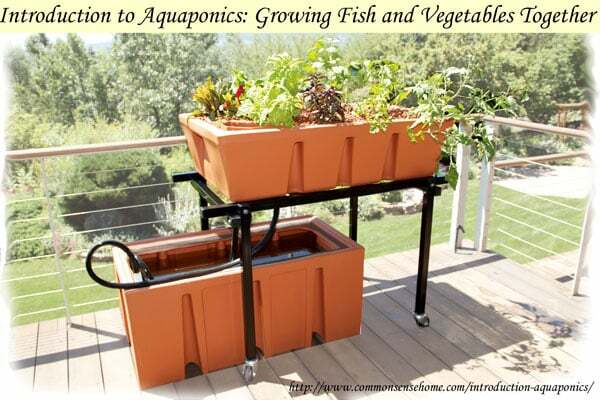 See Introduction to Aquaponics: Growing Fish and Vegetables Together for more information. 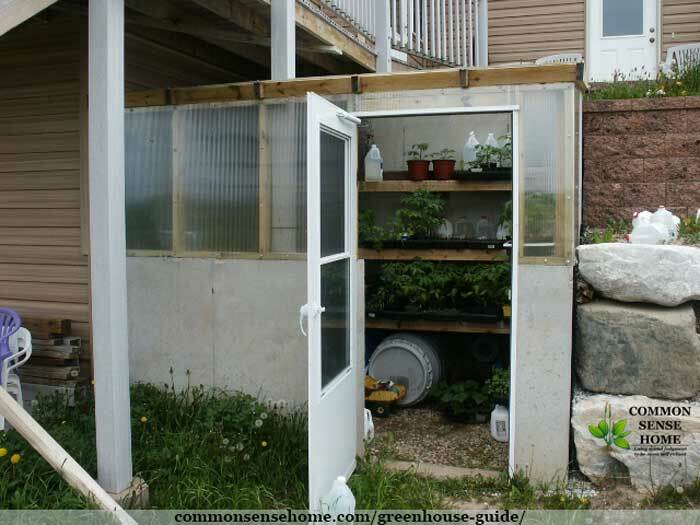 If you search you will find examples of chicken coops linked to a greenhouse. Use this option with caution. Chicken poop is “hot”, and can burn plants, and anyone with chickens knows how they like to dig. It's also best to compost your chicken poop before using it in your garden, to reduce the risk of disease transmission. In The Small Scale Poultry Flock, Harvey Ussery portions off a part of his greenhouse for chickens, which is a much more practical option. With this setup, you can allow your chickens into the rest of greenhouse during the off season to work the soil and clean up bugs. We have our coop connected to the greenhouse, and the runner ducks have been using the greenhouse as a winter shelter. Come planting time, the ducks will be outside full time during the day, and the soil will be worked up to incorporate their droppings. Greenhouses can be closed in with purpose made glass, plastic panels, multiwall polycarbonate panels, and sheets of plastic. The sheets of plastic are measured in MILs. 4mil plastic is generally lighter weight and more easily torn that 12mil (mil refers to the millimeter thickness). There are custom plastic films that may provide better tear resistance, and solar resilience over time. You will need to research each film type for its durability. Also some plastic sheeting is not the best for greenhouses because it will break down in sunlight, or not allow much of the need sunlight wavelengths through. Make sure you select the right type. It should note in the product materials that it is greenhouse plastic. Note: The USDA has a grant program to help farmers afford hoop houses for greenhouse production. You can learn more at the High Tunnel System Initiative home page. Glass is a good greenhouse cover. It will last longer than plastics, but will cost more. Least Expensive: Regular or annealed glass can break more easily than others, in will break into jagged shards, creating a hazard for anyone nearby. Moderately Expensive: The next better option is tempered glass and is 4 to 6 times stronger than regular annealed glass, breaks into small square fragments, and handles big temperature changes. Most Expensive: Laminated glass is dual layer (two sheets of glass bonded together) using a PVB (polyvinyl butryal) between the layers of glass. The windshield of cars and trucks are laminated, making them extremely strong and it wont easily break into pieces. It is good for roofs and other high load, or high impact surfaces in your greenhouse. Note: Regular double pane or triple pane windows are not the best choice for a greenhouse. The warranties for most regular windows are void if put in a greenhouse. Check the warranty before you use regular double or triple pane windows and doors for a greenhouse. If you are using salvaged windows, be aware that they may be more prone to fogging, especially if the seals are broken. Also, modern house windows often have UV blocking coating, which means less light transmission to your seedlings. This slows down plant growth. Older windows may have lead paint, which you don't want near your plants. The large and very greenhouses can be 1/8th of an acre or more. There are old, beautiful Victorian greenhouses have the elaborate glass and have been used for over 100 years. The older greenhouses that are large are sometimes referred to as a conservatory. The famed Temperate House at London's Kew Royal Botanic Gardens (built in 1860) is a great example of one of a beautiful historical greenhouse. We hope you've found this post useful. If so, please share. If you have greenhouse questions or comments, just leave a message below. We invite you to check out the full list of garden posts on the site on the Common Sense Gardening page.